Are you lacking of clarity when it comes to translating creative ideas that are still abstract? Would you like to gain confidence when presenting your project to a client through a clear and concise message? In an ever connected day-to-day, we often feel overstimulated with so much visual information available. As a consequence, you might have noticed your brain is jam-packed with half-formed concepts. This 3 steps program shows you how to break down your ideas based on a thorough analysis, put them into a visual context, and get a concise message across, both in a visual and verbal context. The mood board will act as a facilitator and activator. "I had never thought before of how important the analysis and mind-mapping part could be. Not only it helped to structure ideas and translate keywords into materials on my mood board afterwards, but I would work with much more intention and confidence becoming more aware of my own work." The workshop has taken my business to a new level within weeks! I knew it would help me present ideas to clients from a design perspective but my understanding of how directive, strong and communicative a mood board can be when created from real intention, changed the way I thought about the technique. It has literally changed the way I work! If you’ve ever tried to walk a client through a creative concept, you might have realized it's not always the easiest task. Clients don’t always think like creatives do or speak the same language. If your concept pitch is not crystal clear and effectively delivered, often due to a lack of confidence, your message can be misinterpreted. Having created a well-structured mood board is only half of the process done. Now, how to sell it? "Gudy’s course was a total game changer, it definitely helped to improve my visual storytelling skills which are fundamental when briefing the teams I collaborate with, but also and as important, strengthened my skills in order to communicate more efficiently." Entrepreneurs, shop owners, bloggers, stylists, photographers, wedding planners, teachers, project managers, artisans, all design disciplines (interiors, graphic, fashion, etc. ), and anyone curious working on creative projects. PD: And we offer corporate workshops too. Let us know if you prefer an in-house course by dropping a line. We will work on your clarity, vision, and communication. Watch and listen to some testimonials we received from lovely students who are joining in from all over Europe and the US. Please read our return policy in the FAQ section. By purchasing the course you agree on the terms. Gudy Herder is an international trend consultant, speaker, and certified trainer based in Barcelona, Spain. She help brands and businesses anticipate trends and use them to develop products that inspire, tell a story, and ultimately, sell. 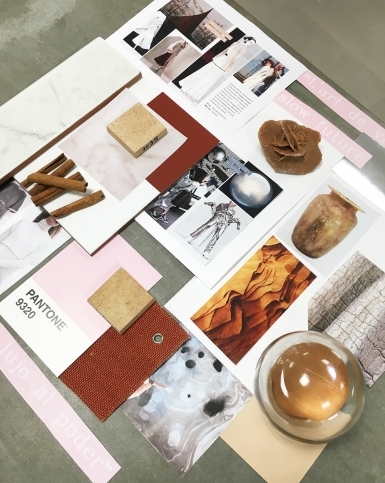 At tactile moodboarding workshops, clients learn how to use moodboards as an effective business tool to articulate trends, present ideas, and win support for projects.